The fauna in the United States boasts a number of different species of insects, animals and birds. This glorious country has one of the most uncommon indigenous wildlife, including some peculiar animals like the Cougar, Wolverine, and Moose among others. Other well-known animals in the United States include the Grizzly Bears, Elks and the Gray Wolves. Today, we are going to be counting down the top 10 US animals. Elks secure the 10th spot on our list. Elks have massive antlers and legs with cloven hooves. Not only are they one of the largest species in the deer family but they are also considered to be one of the largest mammals in North America. Elks are actually found all over the world, but a large part of its population is endemic to the US. They often live in herds containing a minimum of 200 members so that they cannot be predated upon easily. 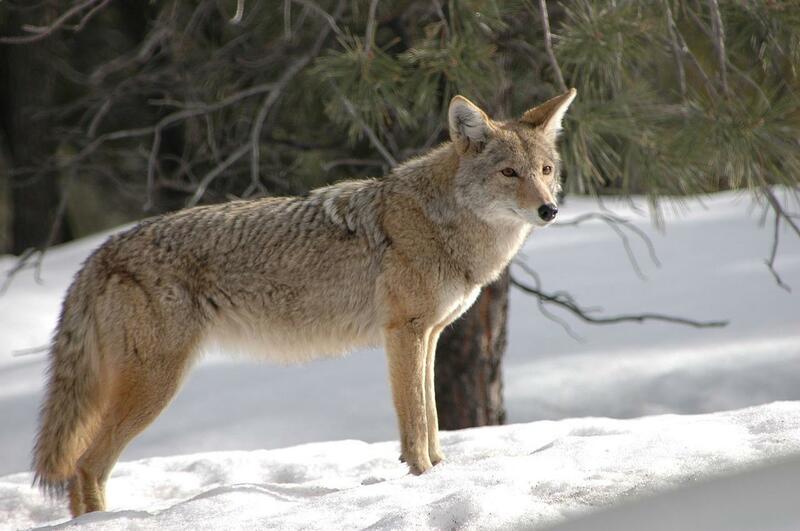 The coyote is a canine native to North America. These creatures are abundant and can be found almost everywhere in North America. They are smaller than their close relatives, the grey wolves. Coyotes are solitary creatures and they roam the plains, forests and mountains of the United States, Mexico and Central America. They are not picky eaters and are very versatile with their diet consuming different animals, snakes, fishes, birds and even rodents. One of the most aggressive animals in the world, Wolverines are the largest members of the weasel family and they are not only powerful but also extremely dangerous. They prefer to live in the colder regions as they make their dens out of snow. They live in the Arctic and subarctic regions of North America and are primarily found in the remote areas of the US state of Alaska. They are the largest land-dwelling species and they are known to travel up to 15 miles at a stretch in search of food. The moose is the largest of all deer species in the world. The males can be instantly recognized by their huge antlers which can spread up to 6 feet from end to end. A large population of these herbivores are found in the northern parts of America but they can be found in Europe too. These animals are huge and with huge size comes a greater appetite. On an average, they consume at least 60 pounds a day. They eat shrubs, woody plants and aquatic vegetation but their diet is restricted in winter when they can’t find much food to eat. The largest moose ever recorded was in the Yukon which weighed a staggering 1,800 pounds! The cougar, also commonly known as the mountain lion is a remarkable hunter and they are known to stalk their prey so stealthily that often the prey doesn’t know until this ferocious lion catches it by its throat. One of the biggest cats in the world are agile jumpers and can jump as high as 15 feet and as far as 40 feet, and if that is not good enough, they can reach a top speed of 50 miles an hour. With the exception of humans, the Cougars have the largest range of any mammals in the western hemisphere. They are found almost everywhere in North America and a small population can be located east of the Mississippi River. The American Bison is the national animal of the USA. It is the largest mammal in North America as they can weigh up to 2,000 pounds and can stand 6 feet tall. Do not let its huge stature fool you. This bison can run up to 35 miles an hour and with that strength and speed, it is very difficult to stop it. Yellowstone National Park is a place in the United States where the bison has continuously lived, ever since prehistoric times. The Gray wolf, also known as the western wolf or the timber wolf, is the largest extant member of the canid family and one of the loudest animals in the world. They are primarily found in the remote areas of North America. Gray wolves are excellent predators and are highly social animals that live in small, nuclear packs. There are 5 different subspecies of these wolves found only in North America. They hunt with precision and hence, they can even kill animals greater than their own sizes such as elks, deer or moose but they consume smaller mammals such as beaver and rabbits as well. The American crocodile is an endangered aquatic animal endemic to the south-eastern regions of the United States. They can weigh up to 2000 pounds and still can travel fast in the land (10 miles per hour) and water as well ( 20-25 miles per hour). They are known to have the world’s most powerful jaws! They are apex predators and are inhabitants of the shallow marshes, swamps and freshwater lands from Texas to North Carolina. Grizzly bears are an extremely large subspecies of the bear family endemic to North America and recently they are found in Alaska as well. They are apex predators of the wild. They also have a very keen sense of smell and can detect the slightest scents coming from miles away better than a hound dog. The Grizzly bears are extremely aggressive as well. It is one of the most popular US animals in the world. The Bald Eagle has been the national emblem of the United States of America ever since 1782 and it can undeniably be recognized by its white head, brown body and a hooked yellow beak. An interesting fact about the bald eagles is that they mate for life… and they have pretty long lives. These are amazing birds and a very good eyesight. Bald eagles are aerial daredevils and usually fly at extremely high altitudes. So, these are the top 10 US animals in the world.